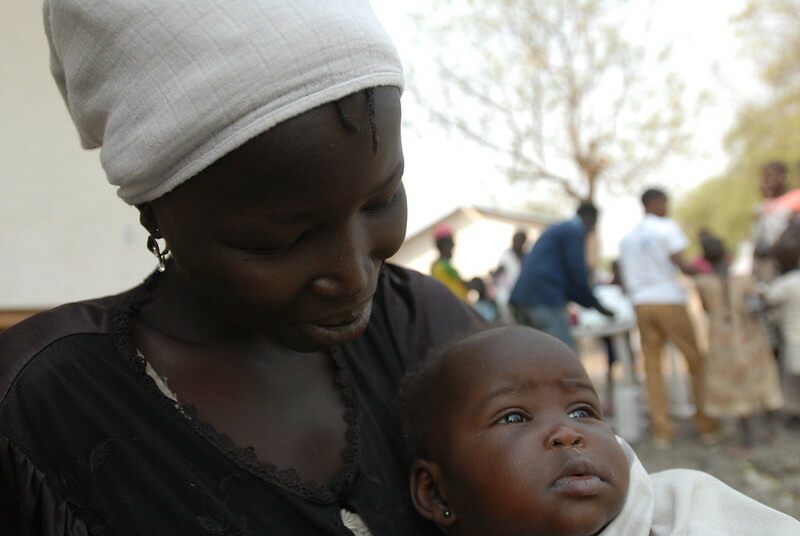 TERGOL, AKOBO WOREDA (GAMBELLA REGION)- Nyabiel Chamjock, a 20-year-old South Sudanese refugee, waits in line at the vaccination post with her nine-month-old daughter in her arms. She joins a long queue of other mothers with young children who are also waiting at the post to receive vaccinations. The growing queue is evidence of an effective community mobilisation campaign carried out in the last few days. In addition to the vaccination post where Nyabiel is waiting, three more posts have been made operational to cope with demand from the rising influx of South Sudan refugees. To ensure that vaccination posts are adequately stocked with supplies – two UNICEF boats regularly deliver vaccines. Nyabiel is one of the thousands of refugees who crossed into Tergol town in January in the Gambella Region of Ethiopia bordering South Sudan. Sadly, Nyabiel lost her husband during the tribal conflict between the Murle and the Lue Nuer tribes more than a year ago. She has recently had to face more tragedy. The eruption of violence in South Sudan, in December 2013, forced Nyabiel to flee into Ethiopia in search of safe refuge. After trekking most of the day on foot, clutching her child and a few selected belongings, she managed to cross the border. After waiting 30 minutes in the queue, Nyabiel’s daughter finally receives her required vaccines. She receives an injection against measles and drops to prevent her from contracting polio; she also receives vitamin A supplementation. In addition, her mid-upper arm circumference is measured to check her nutrition status. The chubby little infant looks surprisingly healthy despite the difficult conditions that her family is facing. Before Nyabiel leaves the vaccination post she is given a card confirming her daughter’s immunisation. She is also reminded that it is important to keep the card safe for future reference. Nyabiel understands the importance of vaccinations for her child. “I know that my child will be protected from diseases after taking the vaccines. It is difficult in this area to keep a child healthy. As it gets dry and hot, children easily fall sick,” she said. 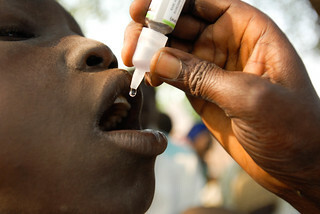 The mass vaccination campaign administered to South Sudanese refugees and members of the host community in Tergol, the capital of Akobo Woreda, is supported by UNICEF in coordination with the Regional Health Bureau. The campaign started at the beginning of January 2014 and more than 95 per cent of children have been targeted for immunisation. UNICEF has prepositioned emergency vaccine supplies in the Gambella Region to ensure a timely response to the acute emergency needs of those fleeing from the violence in South Sudan and also to the vulnerable members of the host community. The mass vaccination campaign is crucial in preventing outbreaks like measles and polio. In the context of population movement across borders – especially in emergency situations – disease outbreaks can easily occur and prevention measures need to be in place to protect vulnerable mothers and children. “This vaccination campaign is very important for the health of children both from the host community and refugees,” says Getachew Haile, UNICEF health emergency officer. “It protects the children from contagious viral diseases such as measles and polio,” he adds. 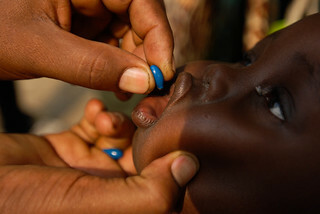 In addition to the provision for vaccines against measles and polio, vitamin A supplementation is also given to children aged between six months and five years. Since the Gambella Region is prone to malaria, a distribution of mosquito nets has also helped to reduce the incidence of malaria morbidity and mortality. The emergency response to South Sudan refugees in Tergol is being coordinated by the Government’s Administration for Refugee and Returnee Affairs (ARRA) and UNHCR. 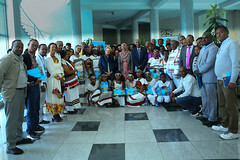 UNICEF supports the health activities of ARRA and UNHCR in partnership with the Regional Health Bureau. Adequate planning and functional systems have been put in place to manage human resource and logistic arrangements. In addition, health workers from Gambella town and adjacent areas such as Gniengnang, Wantowa and Tergol have received a one-day orientation. With the support of the local administration, vaccination posts have been set up in locations that are accessible to the host community and refugees. Community mobilisation work has been an integral part of the vaccination campaign to ensure that community members and refugees are aware of the campaign programme and its importance to the health of mothers and children. Head of the Akobo Woreda health office, Samuel Yien, acknowledges the impact of UNICEF’s support. He says that the emergency vaccination campaign is going well and that the activities are monitored closely. 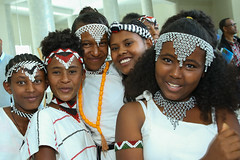 “We are grateful for the support we received from UNICEF. We are coordinating activities together and so far the campaign is good,” he added. The Akobo Woreda (district) is the most inaccessible area in the Gambella Region. To reach the woreda capital of Tergol, one has to take an eight-hour boat ride from Buribe town- the last town accessible by vehicle. Accessibility problems make the role of UNICEF boats essential in delivering vaccines and other supplies to the vaccination posts. 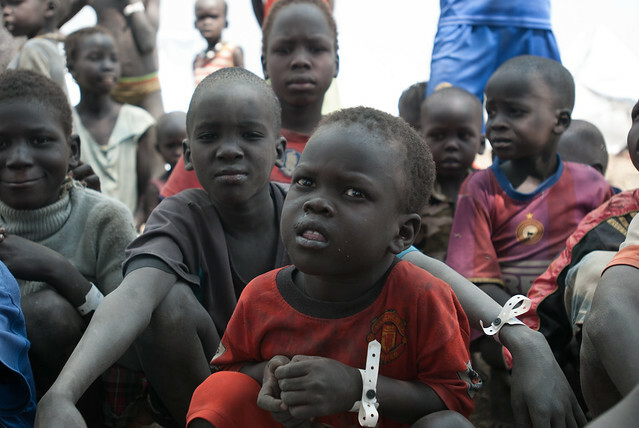 Thousands of civilians, mainly women and children, have been affected by the violence that broke out in South Sudan in mid-December 2013. 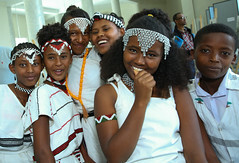 At the beginning of April 2014, the UN refugee agency (UNHCR) estimated that more than 88,000 refugees crossed over the Ethiopian border through six entry points including Tergol, since the conflict began. These people are in desperate need of humanitarian assistance, including food, water and health services. Mothers and their babies are visibly weak after enduring the long trek to Tergol, while some of the children are malnourished. As the influx of refugees increases and puts food supplies under strain, the nutritional status of newly arrived children deteriorates. Although some of the refugees in Tergol are being accommodated by the host community, there are still many more staying in makeshift shelters close to the Akobo River. Nyabiel constructed her small makeshift shelter from sticks and rags to offer some protection from the piercing sun. Her new rickety home is shared with her child, her grandmother and a few scattered bags containing her belongings. She hopes better times await her child. She is keen to keep her daughter healthy and despite the challenges she faces – she is determined to send her to school because “an education will help bring her a better future,” she adds.